Late-nite comedy hosts have become shills for the Democratic Party. They constantly attack conservatives on a nightly basis. But host Jimmy Kimmel really crossed the line with one awful joke about Brett Kavanaugh. The left controls the levers of culture. They’ve completely captured the universities. But perhaps most importantly they have a near monopoly on entertainment media. People are more likely to get their history from a movie than a 700-page book. This allows leftists to rewrite history however they see fit. Movies and television shows that have a conservative bent get far less marketing. Leftists actively tried to shut down two separate pro-life films through fascist tactics. Another plank of the media is late-nite comedy. Dedicated leftists like Jimmy Kimmel and Stephen Colbert mock conservatives almost exclusively. And they do it every night. They comprise the Democratic party’s frontline. It allows them to put out their message softly. These comedians get taken seriously. But if they get called out for their politics, they play coy and say they’re just comedians. Despite the left’s choke hold on the culture, their power is loosening. Conservatives are finding spaces on podcasts, YouTube, and other alternative outlets. This deeply concerns the left. That’s why they’ve pushed these platforms to regulate anti-leftist voices. They started with pro-Trump controversial host Alex Jones. Now they’re slowly coming for all conservatives. As the battle for news rages on, leftists are using the media to unleash a despicable smear campaign. Democrats smeared Brett Kavanaugh after Trump nominated him to the Supreme Court. They’re using every dirty tactic in the book to assassinate his character. Democrats unleashed last-minute allegations to derail his nomination. So far the sneaky tricks haven’t worked. Kavanaugh stood up to the left-wing smear campaign and refused to withdraw his name. But the stakes are high. Democrats believe Kavanaugh will cast the deciding vote to overturn Roe v. Wade. The left is panicking because abortion is their most celebrated value. With their precious abortion on the line, Democrats are now pulling out all the stops. In order to defeat Kavanaugh and block Trump, Democrats are stooping to new lows. And late-nite comics are happy to oblige. Jimmy Kimmel is a constant mouthpiece for the Democrats. He even consulted Chuck Schumer for talking points about health care. 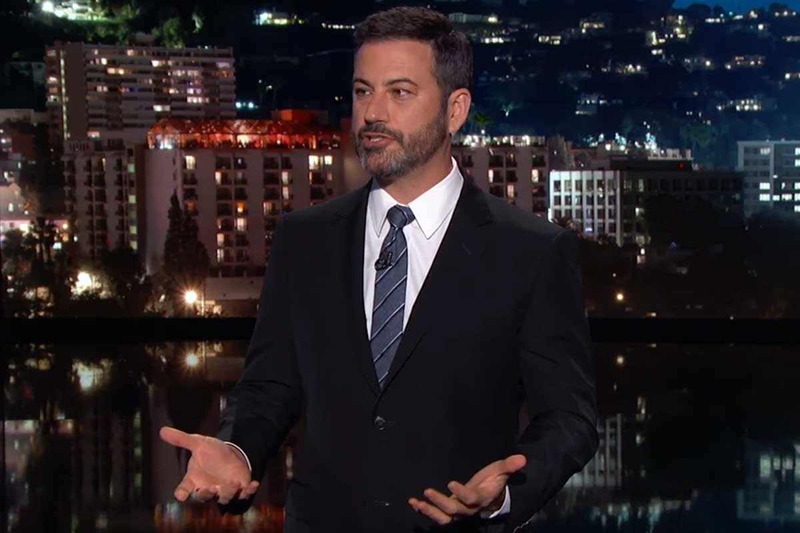 Kimmel also attacks Trump and Republicans every single night. He even told an awful joke about Trump’s marriage to Melania. Just when everyone thought Kimmel reached rock-bottom, he dug even deeper. Kimmel told a vomitous joke about Kavanaugh. That is a vile “joke,” even for the late-nite comedy hacks that use the same material. These comedians used to be funny. But they’ve been afflicted with Trump Derangement Syndrome. It has robbed them of all their comedic chops. All that remains is hollow vulgarity. The American people are getting sick of it.